Eugene Laverty underwent surgery this afternoon to plate his left radius after fracturing the bone in a crash yesterday in testing at Jerez. Laverty's primary injury is a fracture of the distal radius with avulsion of the left ulnar styloid but a fractured vertebrae and shoulder were also discovered today. Having been transferred to Barcelona the Irishman went under the knife to have a titanium plate inserted to the radius joint in a 90 minute procedure. 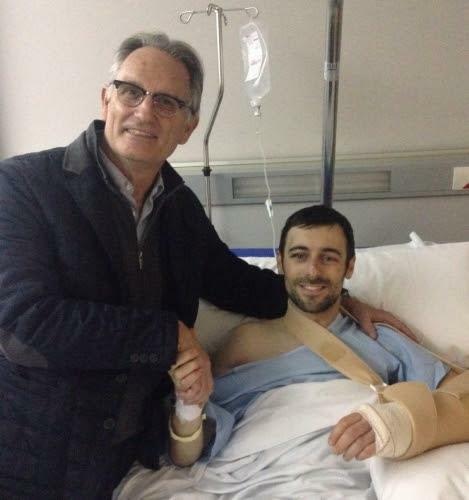 The surgery was performed by MotoGP's regular surgeon, Dr Xavier Mir, who deemed it a success. Laverty crashed at the high speed Turn 7 having started to push harder on his Ducati. The corner sees riders dab on the brakes to scrub some speed on entry and with the Michelin tyres the corner has proved a challenge throughout the week for riders. When he lost the front Laverty crashed and instantly the weight of the fall was felt on his wrist. The injuries were likely compounded by the lack of an air fence at the corner. During the Grand Prix weekend a crash fence is placed at the exit of Turn 7 however during this unofficial test there were much fewer fences and Laverty crashed into a tyre barrier. The full extent of his injuries only became clear today when he had flown to Barcelona and had additional x-ray and CT scans. A 3D scan uncovered a small fracture of the first thoracic vertebra and a fracture in his shoulder but with the surgery having now been completed Laverty can start his recovery. Typically the injury has a four to six week recovery period with riders, including Chaz Davies, telling MCN that they had been back on the bike in this timeframe and able to compete but suffered discomfort on the bike at the time. In the first week of his recovery Laverty will need to adhere to a rigid immobilisation of his wrist and then once the joint has been stabilised he can begin the initial stages of recovery. In the second week the stitches will be removed and an additional x-ray will be taken to confirm the success of the operation and then Laverty can start the rehabilitation stages of the injury. "When I suffered a similar injury it was a six week recovery period for me. The most important aspects were the physiotherapy and just always working had to increase the feeling in the joint. There's a nerve ending in that area of the wrist and you need to get used to moving your hand and fingers again afterwards. It takes time but you can see improvements with it as you move each finger individually." The next MotoGP test is in two months time at Sepang so Laverty should be back to fitness in time for the Malaysian test.